Every serious shooter who reloads for precision rifles should have an up-to-date version of QuickLOAD. 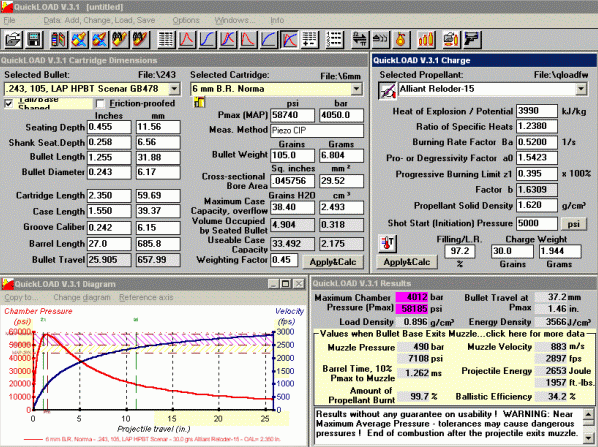 This software program, while not a substitute for conventional load manuals, is an invaluable tool that allows shooters to evaluate a wide range of powders and bullets, comparing potential loads on the basis of predicted pressures, velocities, load density and projectile in-barrel time. The program isn’t perfect, but it IS incredibly powerful. It can pay for itself in the money you save not buying inappropriate components, and it can accelerate the load development process dramatically. 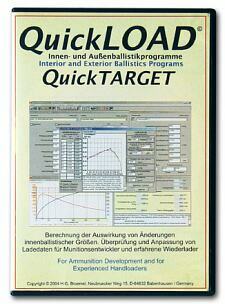 QuickLOAD, sold by Neconos.com, helps reloaders understand how changing variables can affect pressures and velocities. It can predict the effect of changes in ambient temperature, bullet seating depth, and barrel length. However, QuickLOAD has limitations. It is merely a computer simulation. It doesn’t account for different brands of primers for example, and its ability to predict the effect of seating bullets into the rifling is crude. You most certainly should not just “plug in” a bullet and powder and use that load, assuming it is safe. Nonetheless, no other product available to serious reloaders offers as much predictive power as QuickLOAD, and you’ll find your money well spent just for the vast collection of data on bullets and cartridges. With a couple mouse-clicks you can instantly get the specifications of hundreds of bullets and cartridges. Likewise, in a matter of seconds, you can compare load density for a half-dozen powders, or compare the projected velocities of one cartridge versus another. How much more powder will a Dasher hold than a standard 6BR, and how much more speed will you get? QuickLOAD has the answers. WARNING: QuickLOAD is a computer simulation of centerfire cartridge performance. YOU MUST NEVER just “plug in the numbers” and use QuickLOAD’s output for a load recipe. That is foolish and dangerous. There are many reasons why the data QuickLOAD generates may not be safe in YOUR gun. Before loading live ammunition, you should always check with the powder-makers’ most recent load data. In fact, you should check multiple sources if possible, and consult with individuals who actually load for that cartridge. Sierra Bullets offers free load maps which, in general, are fairly conservative. Even when using manufacturers’ load data, start 10% low and work up. Differences in brass, primer brand, and seating depth can make huge differences in pressure. Always reload conservatively and always double- and triple-check QuickLOAD’s output against reliable load data supplied by the powder-makers. IMPORTANT: Numerical values shown in the illustrations are supplied for demonstration purposes only. Do NOT use values found in these illustrations as a basis for actual loads. If you haven’t tried QuickLOAD, you may be surprised at how much of an effect relatively small changes in seating depth can have. QuickLOAD gives you a good sense of how seating depth (and case capacity) affects load pressure. Two questions we’re asked over and over again are “what length barrel should I use?” and “how much velocity will I lose if I set-back the barrel?” QuickLOAD can give some solid (though not definitive) answers. Once we “fine-tuned” QuickLOAD, its predictions matched observed velocities very closely for different barrel lengths. You can buy a dozen different cans of powder seeking the “ultimate” load for your rifle. Or you can use QuickLOAD and narrow the search to three or four propellants that offer optimal load density, burn rates, and velocity. You’ll still have to start low and go out to the range and test, but QuickLOAD can steer you to the right propellants, including lesser-known powders that you might have overlooked. 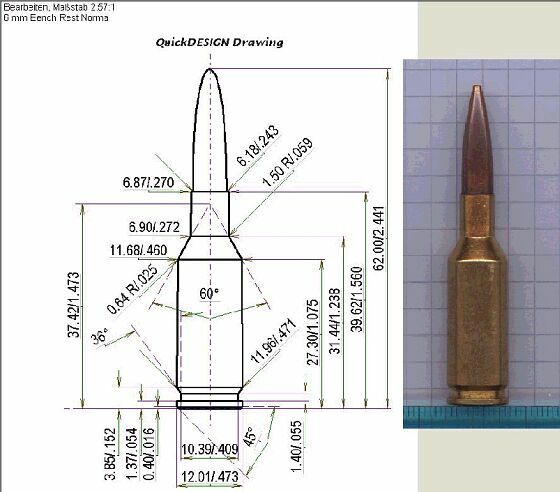 QuickLOAD has built-in specifications for hundreds and hundreds of bullets in virtually every caliber you can imagine. This can save you a ton of time during initial load development–you can easily determine if a particular bullet matches your Freebore, and whether it is a “good fit” for the powder you want to use. There is even a function to compare moly vs. naked bullets. QuickLOAD is the only readily available source that provides Heat of Explosion values for most popular propellants. Quite a few smart shooters, including Henry Childs, believe that powders with very high Heat of Explosion erode throats faster than “cooler” powders. QuickLOAD gives you the ability to select powders based on their heat output. Many shooters believe one key to accuracy is controlling the time the bullet spends in the barrel, so that it exits the muzzle at the optimal point in the barrel’s vibration cycle. Controlling a bullet’s “dwell time” in the barrel is also very important when using barrel tuners, which are now allowed in many benchrest disciplines. Every time you create or modify a load, QuickLOAD automatically calculates the bullet’s in-bore travel time (in milliseconds). While QuickLOAD’s ability to predict the effect of temperature changes on load pressure is somewhat primitive, it still is a tremendously valuable feature. In the 6mmBR.com Blog, we’ve harped on the importance of keeping your ammunition in a stable temperature range. Earlier this summer we tested some ammo loaded with Norma 203B. It was allowed to sit in direct sunlight for 15 minutes. We then ran the sun-baked ammo over the chron and found that velocities were as much as 45 fps higher than the same ammo at 70° F. Using QuickLOAD to extrapolate backwards from observed velocities, it was clear that sitting in the sun had raised pressures by nearly 4000 psi. With QuickLOAD, you can easily get fairly reliable estimates of how pressures change as ambient temperatures rise, or as you alter seating depth. The temp function alone, though simplistic, is worth the price of the program–you won’t be caught at a match with ammo that worked great in the spring but was too hot for summer (see above). And you may be surprised at how significant a .020″ change in seating depth can be. Quickload also allows you to predict the effect of changes in barrel length. We checked this against actual field reports for 26″ to 30″ 6BR barrel lengths, and the velocity increases ascribed to increased barrel length seem pretty accurate. Being able to quickly plug in a dozen different bullets and get a “ball-park” load is a great time-saver. The program also shows “shank depth”, so if you know your case overall length, that will tell you how much bearing surface is actually in the case. We found this very useful in working with the Berger 95 which has a very short bearing surface. We were able to adjust the seating depth so we had a reasonable amount of shank in the neck while still reaching into the rifling as desired. Imagine you are building a new rifle, perhaps in a caliber you haven’t tried before. Immediately you start to wonder, “What barrel length should I use?”, “What powder will give me best load density?”, and “What bullet offers the best trade-off between velocity and BC?” You see such questions posted over and over again on Internet Shooting Forums. Well, QuickLOAD helps you come up with informed choices before you spend your hard-earned dollars. You can sit down, and in a matter of minutes, evaluate the performance of a dozen different bullets, and short barrels vs. long. 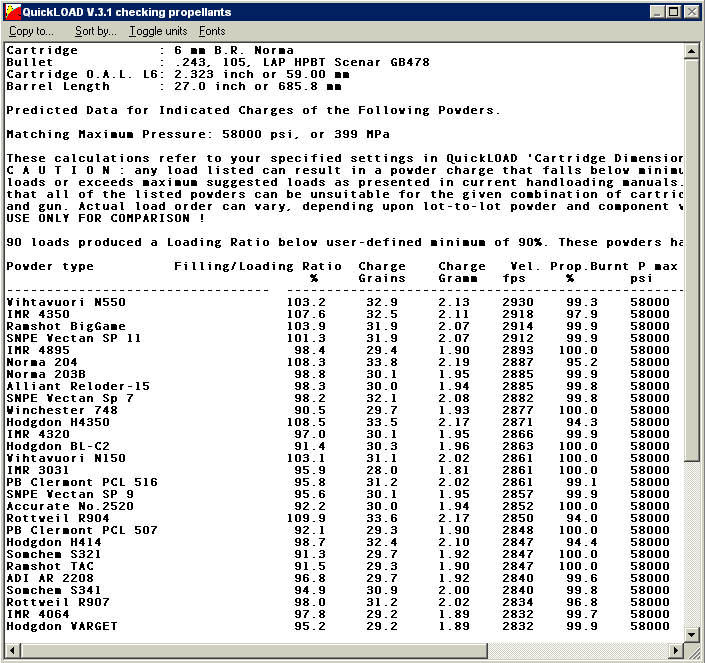 You can tell the program to find you all the powders that will deliver 98+% load density at a given velocity or pressure. Moreover, QuickLOAD can reduce load development time dramatically. QuickLOAD has built-in data on almost all the popular powders. For the 6BR, if you want to compare Varget with N140, IMR 4895, Reloader 15, or Norma 203B, you can use a simple pull-down menu to select a powder choice. Then hit the “Apply and Calculate” button and you’ll get predicted pressures and velocities, displayed in both numeric and graphical formats. Of course, what QuickLOAD predicts may not always jive with reality. Don’t assume that if QuickLOAD says you will get 50 fps more with N203B than RL 15 that you can “put that in the bank.” However, we will say this–when using QuickLOAD to compare 6BR loads with Varget, Norma 203B, IMR 4895, and Vihtavuori 135, QuickLOAD correctly ranked the powders in terms of probable max pressure limits, and predicted actual velocities within about 25 fps for all four powders. And, with a little “fine-tuning”, covered later in the article, we were able to match predictions with observed chron data even more closely. 3. In summer and winter, use QuickLOAD’s temperature function. The default is 70 degrees. That may be a good year-round average for California, but most parts of North America will be much colder in the winter and much hotter in the summer. 5. Continue to follow normal, safe reloading practices. Even if QuickLOAD tells you 33.0 grains of Brand X “Ultra-Powder” is safe in your gun, don’t even think of using that charge if the Brand X’s current load map says that a max charge (with your choice of bullet) is 30 grains. Always start 10% low and work up. In general, we’ve found QuickLOAD’s pressure predictions to be reasonable (so long as you get the seating depth and case capacity right). However in the case of Berger 88s and Varget, we were not able to get anywhere near predicted max velocities before we saw some pressure signs. Remember, every barrel is different. 6. Compensate for bullets seated into the lands. QuickLOAD’s default values are based on bullets that do NOT engage the lands. If you are jamming your bullets, you should modify the “Shot Start Initiation Pressure” value. The pop-up help says you should add 7200 psi to the 3625 psi default start pressure for jacketed bullets. There is probably research to support adding 7200 psi as a general average for rifle cartridges, but we’ve observed that this corrected 10,825 psi level seems too high for the 6BR case with custom barrels. But you should add some amount of correction. We suggest setting start pressure at 5000-6500 psi initially for jammed bullets. -Check cross sectional bore area carefully within the caliber. This you will see, is not standardized and can be useful as a very fine adjustment for your barrel. -Use “shank seating depth” instead of “seating depth”. It’s easier to use. -Adjust weighting factor to calibrate loads as well. This is a very interesting adjustment, in that it actually demonstrates(through calibration) case efficiency from short fat designs vs. long skinny cases. It is based on more powder converting in the chamber, rather than following the bullet as additional mass. As such you will see both velocity increase AND reduced pressure at the same time when lowering this value. Even with its impressive level of sophistication, and its amazing store of data, QuickLOAD has a few shortcomings. Some of them are far from obvious and a novice QuickLOAD user might not understand the significance of them. Temperature–QuickLOAD does have a function to adjust loads for ambient temperatures. However, it essentially treats all powders alike, except for the Hodgdon Extreme powders. As to those, QuickLOAD cautions “Do not use with Hodgdon Extreme Powders”. Well any seasoned reloader knows that all powders don’t react the same to swings in temperature. And we can tell you that even the Hodgdon Extreme powders deliver more pressure in very hot summer conditions, compared to cold winter days. Primers–QuickLOAD lets you adjust for a myriad of cartridge variables, such as groove diameter, case volume, and starting pressures. It can even adjust for moly bullet coatings and bullet shape (flat-base vs. boat-tail). However, there is no simple means to compensate for different brands of primers. Reloaders should keep this in mind when working up to “max” load levels. Hotter primers will affect the powder burn and can raise pressures. The Mysterious Weighting Factor–QuickLOAD has a “weighting factor” it uses to help tailor output values to cartridges of various different shapes and sizes. The default for bottleneck cases is 0.5. “Overbore cases” have been assigned a value of 0.33. But if you click on the 6mm Dasher cartridge profile, the weighting factor is 0.4. Presumably that represents some kind of judgment call, but QuickLOAD doesn’t really provide any criteria for assigning a weighting factor to a particular cartridge that is not a “typical bottleneck.” For what it’s worth, the default value for the 6BR is 0.5, but we got better results using a value of 0.45. QuickLOAD has its own extensive database of cartridges. The latest version includes the 6BRX, the 6mm Dasher, and David Tubb’s 6XC. If you like, you can just leave the Cartridge Selector so that it accesses the default “all-cartridge” file every time. However, we’ve found this becomes cumbersome very quickly. If you’re not shooting .338 Lapua Mags and .500 Nitros, there’s no need to have those cartridges in your pull-down menu. What you can do is create a custom cartridge file. 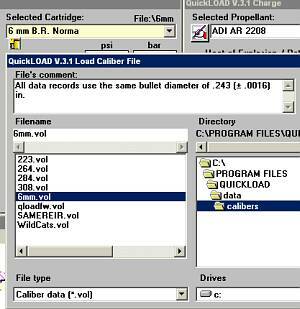 You can call it “6mm File” for example, and tell the program to include all cartridges ± .0016 of a .243 bullet diameter. We did this to create a 6mm file. We also have a .223 File and a .264 (6.5mm) File. It takes only a matter of seconds to build these files. In our 6mm file there are about 45 cartridges. This is much easier to work with than a pull-down list with hundreds of cartridges, including many you’ve never heard of. Once you’ve created your own cartridge sets, you’ll want to create bullet sets. The procedure is similar to building a cartridge set–you tell QuickLOAD to create a new bullet file containing all bullets with the same diameter. We strongly recommend creating custom bullet sets because this will augment QuickLOAD’s default bullet list with many other projectiles found in the four dozen Manufacturer’s data files included with the program. When you tell QuickLOAD to create a new .243 Bullet file, it automatically “gobbles up” ALL the bullet-makers’ data files and combines those with its own default bullet data list. The end result is that you get a caliber-specific list of projectiles that is much more complete than QuickLOAD’s default bullet database for that particular caliber. For example, once we built our custom .243 bullet file, we found we had access to a number of additional bullet descriptions, including the DTAC 115 and some Bergers, that were not displayed previously. Among the 6mm bullets, you won’t find many of the custom brands, but you will find nearly all products of the major manufacturers both in Europe and the United States. Once you’ve created a caliber-specific bullet file, you can augment that with additional bullets, such as 60-70gr 6mm match bullets from custom bullet makers like Bart Sauter or Brady Knight. You’ll need to measure the bullets and enter estimated BC values, but that’s a relatively straight-forward procedure that is explained in detail by the users’ manual. The best way to select a good powder for your handloads is to consult factory load manuals and talk to knowledgeable shooters who are using the same cartridge with the same kind of bullets. No need to reinvent the wheel. If nine out of ten 6XC shooters are using Hodgon H4350, that tells you something. However, there are situations where it makes sense to try something new. You may be using an improved version of a standard case, or perhaps a particular powder is taken out of production, or something new appears on the scene. 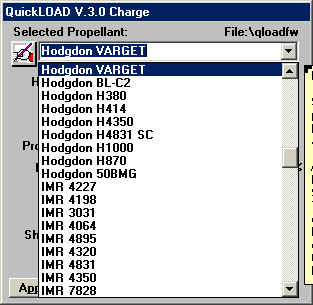 With QuickLOAD you can get the program to generate a list of appropriate propellants, based on the criteria you set. These can include load density, max psi, projected muzzle velocity, and barrel time of entry. The powders will display in the ranking you chose. Normally we have the powders display from fastest to slowest. Using this tool we identified IMR 4895 as a good choice for the 6BR. In fact QuickLOAD predicted, contrary to “common wisdom”, that IMR 4895 could deliver slightly more velocity than Varget. That in fact proved to be true. Interestingly, Hodgdon H4895 charts much differently than IMR 4895. The IMR product has a flatter burn curve, more suitable for the 100-grain class of 6mm bullets. Field testing confirmed that H4895 “pressured out” earlier than IMR 4895 with 100-grainers, meaning that IMR 4895 was a better choice for this weight class of bullets, just as QuickLOAD predicted. The more recent versions of QuickLOAD include a library of Cartridge Diagrams generated by QuickDesign, a companion product from the same maker. There are over 400 cartridges, about half of which include a cartridge photo. These handy Cartridge Diagrams provide all the critical case dimensions. 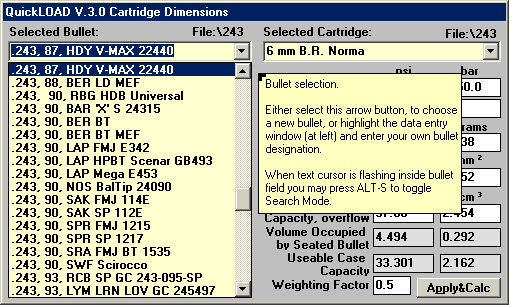 If the cartridge you’re viewing has a Cartridge Diagram, you’ll see a small icon under the “Selected Cartridge” pull-down menu in the left QuickLoad window (the bullet and cartridge data entry window). Click on the icon and the diagram will appear. This can be resized larger or smaller with your mouse. To capture the image, type Ctrl-Alt-C. This places the diagram in the computer’s “clipboard” and you can paste it into your image editing program or a Word Document. Or, just select Ctrl-Alt-P to print out the diagram. We’ve double-checked ten or so of the diagrams against published cartridge drawings, and they seem pretty accurate. But don’t use these as a substitute for a SAMMI cartridge blueprints when ordering a reamer for example. These Cartridge Diagrams are intended as convenient reference tools. They are NOT to be used for engineering purposes. After using QuickLOAD for six months, and logging some solid velocity numbers for four different powders, we’ve found that a little tuning of the program improves its predictive abilities for the 6BR cartridge. NOTE–the following recommendations are for “fine-tuning” QuickLOAD’s data output for the 6BR case only. You can likewise adjust default settings for other cartridges, but you’ll need to find your own ideal parameters. 1. Temperature: The default load temperature in QuickLOAD is 70° Fahrenheit. You’ll want to raise this temp value for summer shooting. At the upper right hand corner of the powder window, just to the left of “Selected Propellant” there is a small icon of a hand holding a pencil. Click on that and a thermometer icon appears. Click the thermometer and a dialog box appears that lets you change the default temp. We suggest you input the highest temp at which you’ll be shooting during the day. 2. Weighting Factor: QuickLOAD has a user-adjustable “weighting factor” for all cartridges. It defaults to a value of 0.5 for all “bottleneck cases”. We noted that the 6mm Dasher cartridge data uses a weighting factor of 0.4, the default value for “overbore cartridges.” As an experiment we changed the weighting factor for the 6BR to 0.45. This seemed to produce more accurate velocity results. 3. Case Capacity: The default H20 capacity for the 6BR case is 37.80 grains. However, when we measured our fired and full-length sized cases, the H20 capacity was 38.40 grains. This makes a HUGE difference in reported pressures. 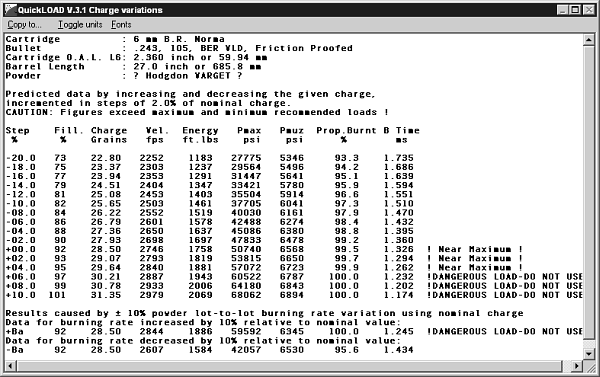 For initial fire-forming loads, use the 37.80 default figure. After that, measure the ACTUAL volume of your cases as they are actually loaded. Thus, measure the fired case (with fired primer) if you neck-size only. If you full-length size, then size a fired case (leaving the primer in place) and measure its capacity. 4. “Jam Seating” Adjustment: QuickLOAD recognizes that seating bullets into the lands can create increased start pressure. That’s sensible. However, QuickLOAD recommends that “with bullet seated to touch rifling, add 7200 psi to Start Pressure” for all situations–regardless of caliber or amount of jam. We found that, for the 6BR, if we added 7200 psi to the 3625 psi default start pressure, for a total of 10825 psi, QuickLOAD predicted velocities well in excess of reality. For the 6BR, we recommend that, if you seat your bullets .005-.010″ into the lands, you first try 6000 psi as the start pressure. (We ended up getting the best results at 5000 psi.) Obviously this value could be different for a 22BR or 30BR. 5. Varget vs. ADI AR 2208: Hodgdon Varget and ADI AR 2208 are supposed to be the same thing. However, we found that there are differences in the way the two powders display predicted speeds and pressures. We found that by selecting ADI AR 2208 rather than “Hodgdon Varget”, our predicted velocities and pressures were closer to what we observed in the real world. This could be because the formulation of Varget has changed and the data for ADI AR 2208 is more current. When we made all the above corrections, our predicted velocities were within 5-10 fps of observed chronograph data. But your results may vary if you are using different primers or if your barrel has different friction characteristics. With any cartridge, you should always adjust for ambient temperatures and actual case volume. There were some oddities we noted when running QuickLOAD 3.1 on machines with Windows ME or XP (personal edition). First, sometimes after we clicked out of QuickLOAD to another program and then back to QuickLOAD, we could not enter data at all. We learned that if we simply clicked once or twice on the QuickLOAD program tab along the bottom of the Monitor screen (where it lists all active windows), then QuickLOAD’s ability to accept new data entry was restored. 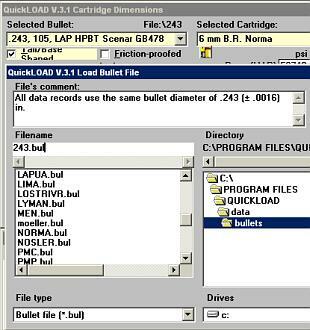 Not all of the bullet descriptions provided on the QuickLOAD CD appear in QuickLOAD’s master bullet file, QLOADFW.bul. If you want to see ALL the bullet entries available, we suggest you create your own cartridge and bullet files by caliber. This is explained above. In other words, for 6mm, create a new .243 Cartridge File and accompanying .243 Bullet File. This will also “sweep” data from all the bullet manufacturers’ data sheets. The QuickLOAD users’ manual is a very lengthy Adobe Acrobat file–extremely detailed and comprehensive. However, some of the program’s key features are buried deep in the document and most users might never find them. The program could benefit from a simple two- or three-page “cheat sheet”, with photos, that clearly explained each button and important function. And, even after reading the manual three times, some of the more advanced elements (like adjusting for barrel friction and creating custom cartridges) remain obscure. Truly, one could take a semester college course on this program and still not master everything it can do. If you move one of the QuickLOAD windows, it will not automatically snap back to grid. You can force the windows to snap to grid by selecting “Windows > Arrange tiled” from the QuickLOAD menu. This command will also resize the top-most window to make it nest without obscuring other windows. In the earlier version 3.0 of QuickLOAD, we noted that some bullet entries were actually listed with the wrong bore diameter. This will cause all sorts of problems and generate error messages if you try to run calculations. We haven’t seen this flaw with version 3.1 for the bullets we’ve tested, but be sure to check the stated bullet diameters (and weights) before you run any calculations. When we initially used QuickTARGET, the companion external ballistics program bundled with QuickLOAD, we were puzzled by the numbers generated for come-ups. Then we realized the program defaults to centimeters and mil-radians. You can change this by going to “Options > Sight Adjustment Set-up” and change to quarter-MOA clicks. QuickTARGET then displays come-ups in quarter-MOA clicks for specified yardages. Very handy. You can print this out and tape it right to your stock. Be sure to adjust for range altitude and temperature first. In the field, we found that QuickTARGET wasn’t quite as good as the JBM Ballistics program in predicting the true come-ups we needed. QuickTARGET put our POI 4″ high at 600 yards, while JBM was pretty much dead on. Copyright © 2010, 6mmBR.com | AccurateShooter.com, All Rights Reserved. No reproduction of any content without advanced permission in writing. Topics: Reloading, Reload, Reloader, powder, internal ballistics, QuickLOAD, Quick-Load, Quick LOAD, QuickTarget, QuickDesign, cartridge diagram, case capacity, seating depth, ballistic coefficient, case overflow, boat-tail, Vihtavuori, Hodgdon, ADI, 6mmBR, 6BR, Heat of Explosion, Friction proofing, moly coating, velocity, barrel time, barrel length, computer.